Don’t forget now … we’re all in this together! The British public has endured the expenses scandal, a cabinet ministerdescribing police officers as plebs and a Labour MP sending an allegedly snobby tweet about “white van men”. But for sheer chutzpah, the peers of the realm have potentially topped the lot. It has emerged that a proposal to save taxpayers some money by making peers and MPs share a catering department has been rejected “because the Lords feared that the quality of champagne would not be as good if they chose a joint service”. Were the Lords right to be so sniffy, asked another committee member, Democratic Unionist MP Ian Paisley? The House of Lords – which has a £1.3m annual catering budget – has bought in more than 17,000 bottles of champagne since the coalition took office, enough to give each peer just over five bottles each year, at a cost of £265,770. 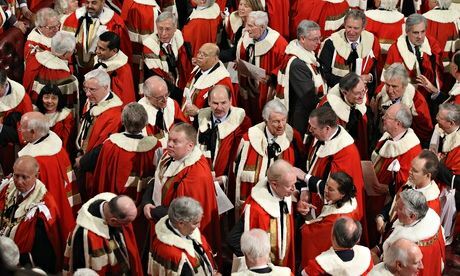 As of 31 March this year, the House of Lords, which currently has 780 peers, had 380 bottles of champagne in stock, worth £5,713, held in its main cellar and at individual stores on site. A former leader of the Commons, Peter Hain, said the revelation only went to make the case more compelling for reform of the way the palace of Westminster was run. “Parliament can sometimes be a complete pantomime of itself and I am afraid this is a case in point. The case for continued reform is now overwhelming,” he said. The governance committee is taking evidence as part of a consultation over whether the palace of Westminster should be run by a clerk who also has duties to advise on constitutional and legislative matters, or should be split up, with a corporate-style chief executive taking over responsibility for the £200m-a-year budget. Yet the committee’s work is in danger of spilling a series of uncomfortable secrets about the way the parliamentary estate, on which 1,800 people are employed, has been managed. The committee taking evidence from MPs, peers and former clerks of the Commons has heard tales of mice running through the MPs’ tearooms, perennially overflowing urinals, a visitors’ centre with a permanently leaking roof, and an account of how even the clerk of the Commons’ jaw dropped when he first heard what MPs had been able to claim on expenses. This entry was posted in House of Lords and tagged Champagne, House of Lords, Jack Straw, Peter Hain, Sir Malcolm Jack. Bookmark the permalink. 8 Responses to Don’t forget now … we’re all in this together! Glynis, are my eyes starting to go or is it snowing on your site ?? Ha ha …. no nothing wrong with your eyes it is snowing on my site. The story is, one evening just before last Christmas after a glass of wine or two; I pressed some bloody button on wordpress and hey presto … snowflakes. I don’t know how to get rid of them but apparently they only appear during the Winter months. Thank god for that !